Oh Modern Basics, how I love thee! Even the 'happy' part of the sentiment is from PTI's Modern Basics and 'holidays' is a partially stamped sentiment from PTI's Stocking Prints. I love how two sets have combined to make a fab sentiment - that font makes me swoon a little y'know! Oh Aimes! I love your modern take on a poinsettia!!! This is AMAZING! Totally CASEing this one! So inspiring! Um, wow! You are so clever. Pure clean and simple beauty. simply fabulous!! I'm in love! Clean and simple! It's so your style and I love it! Wow--such a superb job with your stamping--love this! And the CAS design with the bling--SO pretty! Amazing. I love it when you play with Modern Basics. Ack! This is fabulous! I never saw a poinsettia in that set before - but know a whole lot better now! Sooooooo elegant and so clever! Awesome cards Aimes! 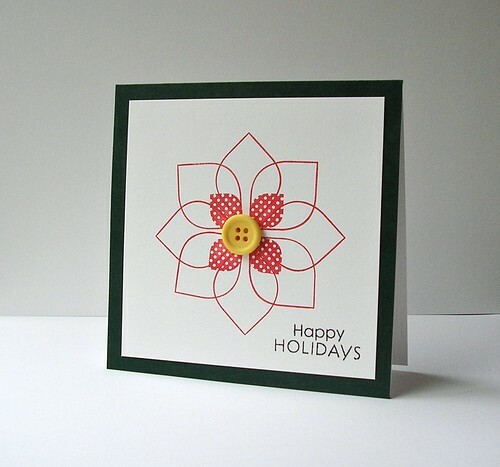 LOVE the modern take on Amy's card and the focus on the poinsettia. LOVE your take on the inspiration! I'm in awe of how you make simple look fabulous! 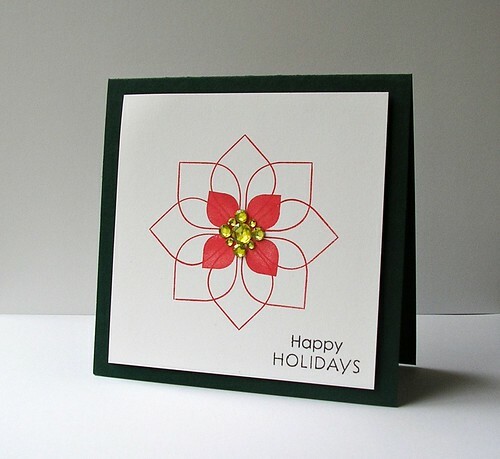 Love your modern poinsettia! Excellent!